You can easily wire this breakout to any Arduino-compatible microcontroller. 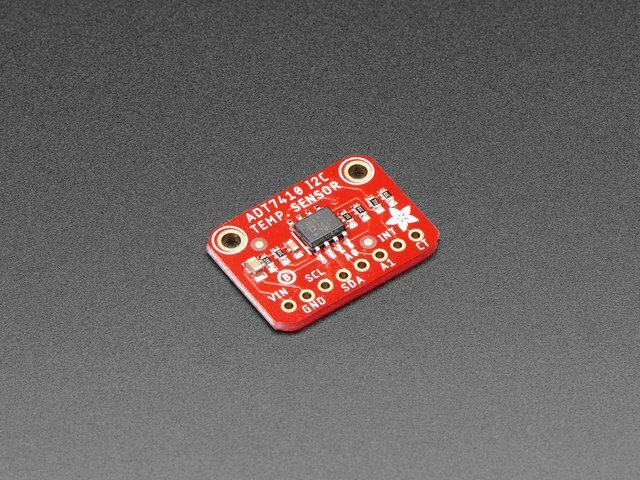 ADT7410 Vin to 3V or 5V (depending on the logic level of your board). ADT7410 GND to Metro GND. To read data from your ADT7410, you will need to install the Adafruit_ADT7410 library. It is available from the Arduino library manager so we recommend using that. Upload the sketch to your board and open up the Serial Monitor (Tools->Serial Monitor). You should see the temperature in Celsius and Fahrenheit. This function returns True if the ADT7410 was initialized correctly, and False if it was not. This guide was first published on Feb 06, 2019. It was last updated on Feb 06, 2019. This page (Arduino) was last updated on Apr 21, 2019.